An above-knee or trans-femoral prosthesis is used for any amputation transecting the femur bone or a congenital anomaly resulting in a femural deficiency. The above-knee prosthesis has four major parts: the socket; the knee system; the shank; and the foot-ankle system. A variety of sockets, knees, shanks, feet, and ankles are available and can be combined to produce a prosthesis that best meets the needs of each individual amputee. 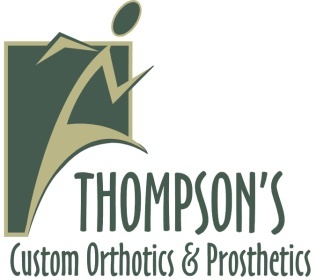 At Thompson’s, we use the use cutting edge technology such as the C-Leg, Proprio Foot, and myoelectric controls, which allows us to more effectively mimic the functionality of the anatomical limb. The C-Leg uses hydraulic cylinders to control the flexing of the knee. Sensors send signals to the microprocessor that analyzes these signals, and communicates what resistance the hydraulic cylinders should supply. The C-Leg functions through various technological devices incorporated into the components of the prosthesis. The C-Leg uses a knee-angle sensor to measure the angular position and angular velocity of the flexing joint.